Mummy and cousin visited Namdaemun Market earlier this morning to beat the crowd and cram in an additional shopping experience before meeting the rest of the gang at Caffe Bene. The plan was to take the cable car to Namsan Tower, have some cute and fun time at the Teddy Bear Museum, savour the view from the Namsan Tower Observatory before heading back down to Myeongdong for some shopping. However, the simple plan turned complicated. We got off at Myeongdong Station Exit 4 and walked all the way straight till we see the sign that says Namsan Oreumi. 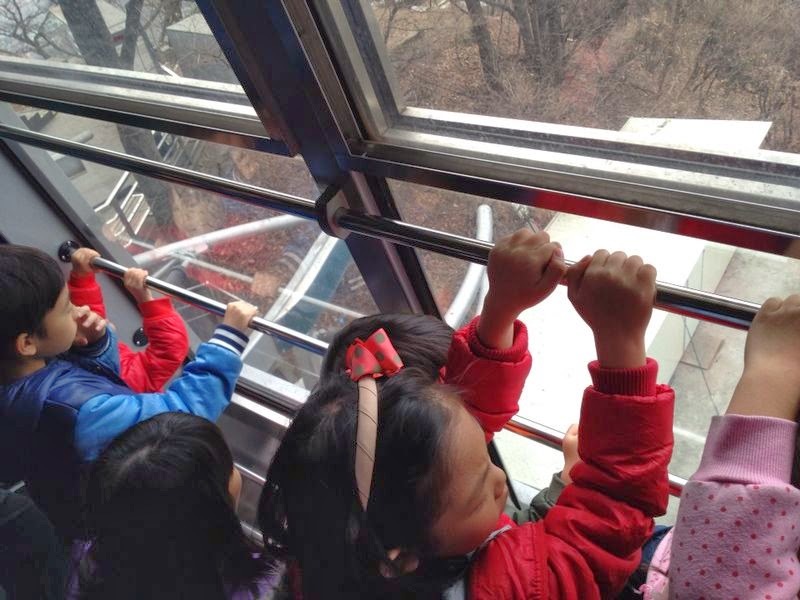 It is a glass elevator that takes us up all the way to the Namsan Cable Car Station so we don't have to grace those steep slopes. When we got there, it was under maintenance and we asked the staff, he said he had no idea what time they would finish. Dejected, it seemed like we had no choice but to walk the slopes after all. With a stroller in tow, the steps up seemed like an hour long, even though it only took us about 10 minutes to move the whole gang along. We got two way tickets for the Cable Car (Adult 8500 won, Child (more than 36 mths) 5500 won. One way ticket: Adult 6000 won, Child 3500 won) and were finally on our way. How our journey should have been like if the glass elevator was working. Nonetheless, we made it to the cable car. The kids had the best view. Winter fog filled the sky. Imagine the scene in winter where everything is covered in white snow. Finally arrived at Namsan Tower. 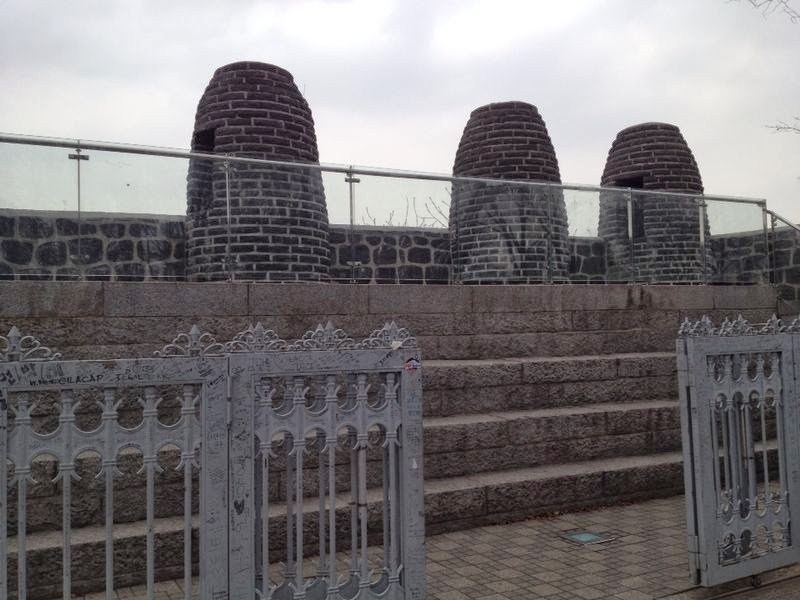 Gyeongbongsu - beacon hill site. Used as a communication station in the past. Smoke signals by day and fire signals by night. To our dismay, the Teddy Bear Museum has been replaced by Alive Museum (another Trick Eye Museum). We were so looking forward to seeing those cute teddies again. As for Alive Museum, having had a great time at Hongdae's Trick Eye Museum, we gave it a miss to have more time doing other things. 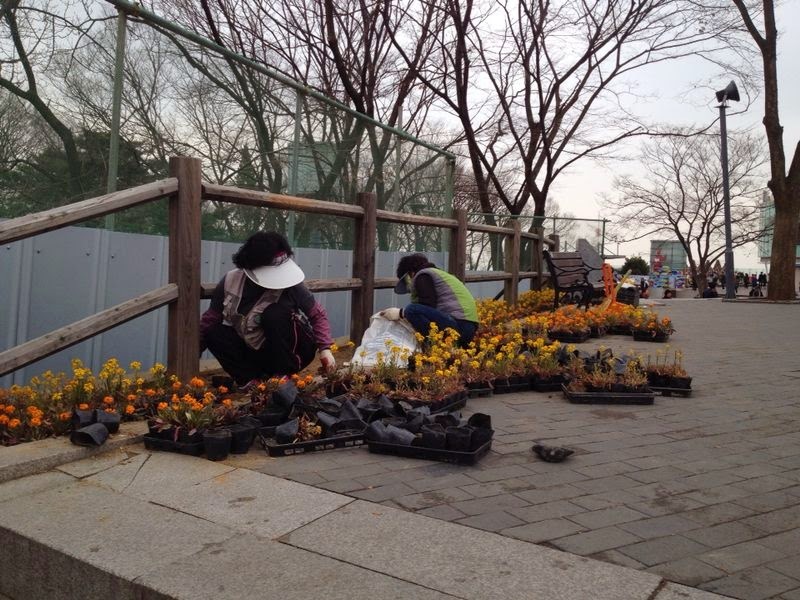 We bought tickets for only the Observatory Deck (Adult: 9000 won. Child: 7000 won). The cities and figures in km written on the glass panels - the distance from Seoul's Namsan Tower to the respective cities. Serene view of Seoul's city skyline, balanced with nature. For a 500 won coin, you can get a better look of the surrounding. There is a souvenir shop and candy store in the middle of the observatory. Restaurants and souvenir shops on level one. Go to the roof terrace and you would see walls of locks. Lovers come here to place locks on the wall, signifying everlasting love. Doesn't the place ever face the problem of (locks) overcrowding? Just simply amazed by the enormous number of locks. By the time we got to the parade square, a crowd had gathered for the Traditional Korean Cultural Performance. Potato snack on the way down to the cable car station. Fried and twisted. Just the right snack for the hungry kids. Too hungry to venture to Myeongdong. Ended up eating at the Korean restaurant at the Cable Car Tower. Food always tastes extremely delicious when you are hungry. It was almost 5pm by the time we finished our late lunch and we were ready for some serious night shopping at Myeongdong. We traced back our steps and arrived at Myeongdong Station Exit 6. Myeongdong was getting crowded so we decided to find a café to house all the kids and bags while the adults move out in batches. I must admit, we had really good strategic planning and teamwork. Selling everything related to fashion. No shopping is completed without street food and snacks. Myeongdong has a range of restaurants to choose from too. We entered one for a late dinner before returning to our apartments to retire for the day. The day had been long, with all the walking, but nonetheless a fruitful one. Budaejjigae on a cold night warms us up. Seoul Day 4: Back to Lotte World!